Every cancer patient is unique, as is their particular type of cancer. Clinicians, researchers and scientists are learning that it’s not necessarily the location of the cancer, but the gene mutations within the tumor, that are important. Therefore, researchers are looking to tailor cancer treatments based on the characteristics of each patient’s tumor. This newest approach, called precision medicine, uses “basket studies” that focus on treating similar cancer-causing gene mutations in a similar way — regardless of the location or type of cancer. One such basket study is the National Cancer Institute’s Molecular Analysis for Therapy Choice study, or MATCH. This unique cancer research trial analyzes 143 genes associated with cancer. Keith T. Flaherty, MD, a medical oncologist from Massachusetts General Hospital Cancer Center and Director of the Henri and Belinda Termeer Center for Targeted Therapies, is leading the study. Using randomized trials, researchers are testing the effectiveness of a particular drug (or a combination of drugs) to fight a gene abnormality that causes cancer and continues its growth. By the end of 2017, researchers hope to conduct tumor gene screening on 5,000 patients to determine their eligibility to participate in these trials. The MATCH study has several different components, or arms. One of those arms is COMET (COMmunication and Education in Tumor Profiling), quality-of-life research that adds a psychological component. 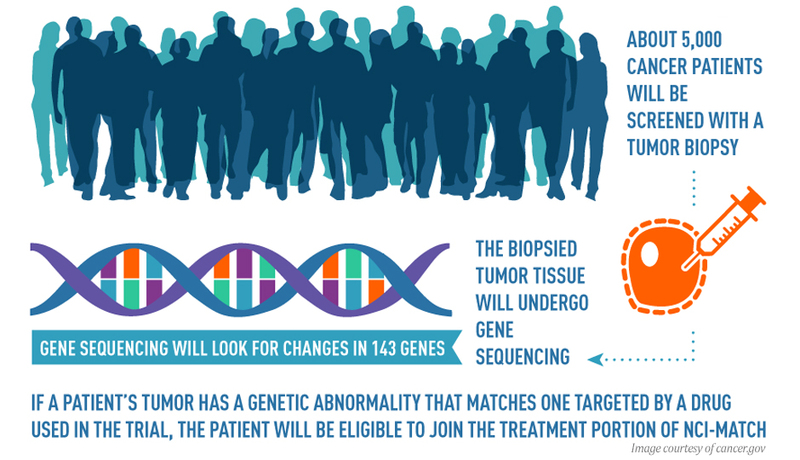 500 patients who have enrolled in the MATCH trial and have not yet received results of their tumor gene testing are eligible to participate. These patients complete a self-guided online genetic testing program. After patients complete the module, they learn results of their tumor gene testing: They may either have 1) Non-inherited (somatic) gene abnormalities 2) Potential inherited (germline) changes 3) Neither of these or 4) Both of these. If a non-inherited abnormality is discovered, the patient learns if there is a drug or combination of drugs to effectively treat it. While discovering a germline abnormality is rare, it lets patients know whether an inherited gene mutation could be passed on to other family members — the number one question patients ask after receiving their screening results. COMET’s secondary arm involves a study of 100 patients with that rare germline mutation. It aims to assess the practicality of offering genetic counseling via telephone. Major cancer centers with genetic counselors on staff are already using this method. However, the problem is that on a national scale, there may be no available genetic counseling. “According to Dr. Flaherty, “In MATCH, two-thirds of the enrollments are in community-based sites.” Telephone counseling may not solve the problem because it’s a form of clinical care, and some states require licensing for genetic counselors who provide care to patients across state lines. To be eligible for the MATCH study, patients must be 18 or older, and have any type of solid tumor or lymphoma that has either returned or worsened after standard cancer treatments. At least 25% of the participants must have or had a rare type of cancer. For more information about participating in the study, contact Mass General Hospital Cancer Center.